The Bell P-39 Airacobra was one of the principal American fighter aircraft in service at the start of World War II. It was the first fighter in history with a tricycle undercarriage and the first to have the engine installed in the centre fuselage, behind the pilot. Although its mid-engine placement was innovative, the P-39 design was handicapped by the lack of an efficient turbo-supercharger, limiting it to low-altitude work. Nevertheless, it was supplied to the Red Army on lend-lease, which used it with great success. Its pilots scored the highest number of individual kills attributed to any US fighter type. Other important users were the Free French and co-belligerent Italian air forces. Together with the derivative P-63 Kingcobra, these aircraft became the most successful mass-produced fixed-wing aircraft manufactured by Bell. In 1940, the British Direct Purchase Commission in the US ordered 675 of the export version Bell Model 14 as the "Caribou" on the strength of the company's representations on 13 April 1940. The performance of the Bell P-39 prototype and 13 test aircraft which were able to achieve a speed of 390 mph (630 km/h) at altitude was due to the installation of turbo-supercharging. The British armament was two nose mounted 0.50 in (12.7 mm) machine guns, and four 0.30 in (7.62 mm) machine guns in the wings, the 37 mm gun was replaced by a 20 mm (.79 in) Hispano-Suiza. The British export models were renamed "Airacobra" in 1941. A further 150 were specified for delivery under Lend-lease in 1941 but these were not supplied. The Royal Air Force (RAF) took delivery in mid 1941 and found that actual performance of the non-turbo-supercharged production aircraft differed markedly from what they were expecting. In some areas, the Airacobra was inferior to existing aircraft such as the Hawker Hurricane and Supermarine Spitfire and its performance at altitude suffered drastically. On the other hand it was considered effective for low level fighter and ground attack work. Problems with gun and exhaust flash suppression and compass were fixable. No. 601 Squadron was the only RAF unit to use the aircraft operationally, receiving its first two examples on 6 August 1941. On 9 October, four Airacobras attacked enemy barges near Dunkirk, in the type's only operational action with the RAF. The squadron continued to train with the Airacobra during the winter, but a combination of poor serviceability and deep distrust of this unfamiliar fighter resulted in the RAF rejecting the type after one combat sortie. 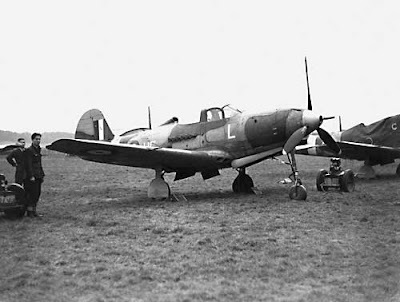 In March 1942, the squadron re-equipped with Spitfires. Airacobras already in the UK, along with the remainder of the first batch being built in the US, were sent to the Red Army, the sole exception being AH574, which was passed to the Royal Navy and used for experimental work, including the first carrier landing by a tricycle undercarriage aircraft on HMS Pretoria Castle. It was scrapped on the recommendation of a visiting Bell test pilot in March 1946.